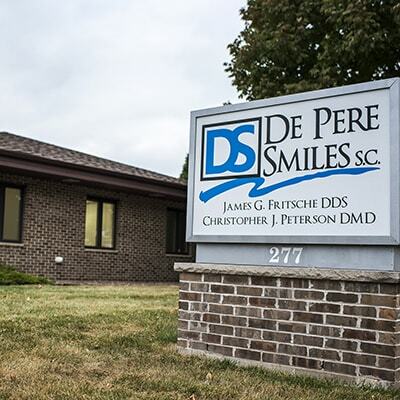 New Dental Patients De Pere WI | De Pere Smiles S.C.
Bring the small town feeling into your care. Creating a warm, friendly atmosphere starts with the patient experience! We offer all of our new patient forms online. Select your designated forms below. Do you prefer to print and fill out paperwork? You can download them right from our website! Get a glance of your visit with De Pere Smiles. Enter our office and our wonderful front desk staff will graciously welcome you to our practice and will answer any and all questions you may have about your appointment. Your first appointment is all with one of our doctors, Dr. Peterson or Dr. Fritsche. First they’ll conduct a comprehensive exam of your smile, including digital x-rays, oral cancer screening, gum evaluation, and bite exam. Your first cleaning with De Pere Smiles will be with our doctors. Either Dr. Peterson or Dr. Fritsche will do a gentle and thorough cleaning of your smile to get rid of plaque and tartar. This extra time with our dentists allows you to spend as much time as you need to answer all of your questions. Together, you and our De Pere dentist will discuss your treatment plan and what needs to be done to reach your smile goals. I highly recommend this office. I came in as a new patient just last year and have been very impressed with the level of care I have received. They do a great job. That’s okay! We’re experts in answering questions. Consult our FAQs below or give us a call. We accept most dental insurance plans, including being PPO providers with Delta Dental Premier. We are happy to file the necessary forms to help you receive the full benefits of your coverage(s); however, we make no guarantee of any estimated coverage or payment. Because insurance is an agreement between you and your insurance company, all patients are responsible for all charges. Yes! We love welcoming patients of all ages to De Pere Smiles. We even offer unique services to help your little ones, including infants who are tongue-tied or have trouble breastfeeding. Consult our Services page to learn about Infant Laser Frenectomies. How does laser dentistry make my dental care better? We don’t have to use needles and drills as often! Our Solea laser allows us to do routine procedures, such as dental fillings, without injecting anesthesia. This means you won’t have to experience the numbing sensation and receive your dental work in a fraction of the time compared to traditional drills and needles. Additionally, the Solea laser is virtually pain-free, making your healing times shorter and allowing you to get back to the things in life that matter to you the most. Too good to be true? Experience it for yourself! Ask us today to see if you’re a candidate for the Solea laser. Yes, you will and with a twist! 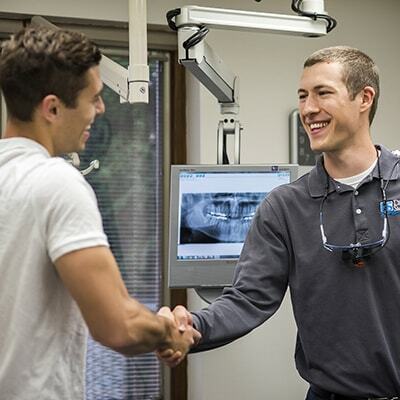 At your first appointment, one of our dentists in De Pere will perform the cleaning to get to know you. Schedule your appointment with the De Pere Smiles team today!